Now is the perfect time to invite birds to raise a family in your backyard. During nesting season, birds need all the energy they can muster. 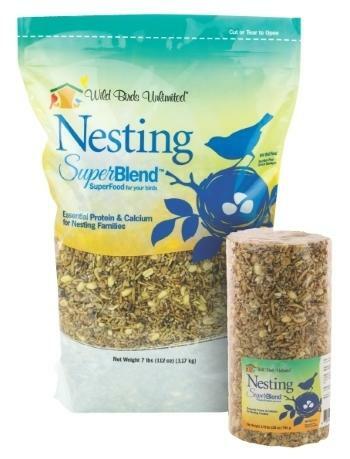 You can help by offering our new Nesting SuperBlend. This no waste mix is chocked full of shelled sunflower, shelled nuts, nutra-safflower, dried mealworms, and bark butter bits. It provides birds a super-boost of the protein and calcium they need as they find a territory, build a nest, lay eggs, raise their young, and go through their post-nesting molt. Available as a loose seed blend in a 7 lb bag or as a cylinder, and both are ON SALE for Bend Daily Savings Club members through March 31. *While supplies last through 3/31/19 for current Daily Savings Club Members on in-store purchases at the Bend, OR WBU. Not valid on previous purchases.